Last major update issued on September 16, 2005 at 03:30 UTC. The geomagnetic field was quiet to severe storm on September 15. Solar wind speed ranged between 529 and 960 (all day average 711) km/sec. The leading edge of the CME seen late on September 13 in LASCO images was observed at ACE near 08:35 UTC. There was no proper solar wind shock, however, solar wind speed increased from 550 to 960 km/sec over the next few hours. 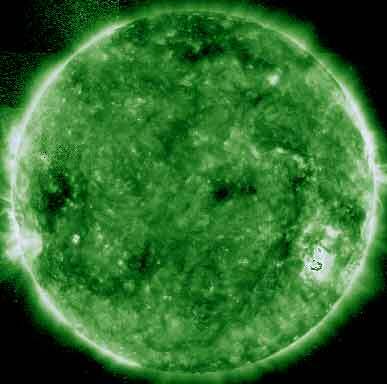 The geomagnetic disturbance was less intense than had been forecast. Solar flux measured at 20h UTC on 2.8 GHz was 119.4. The planetary A index was 43 (STAR Ap - based on the mean of three hour interval ap indices: 43.1). Three hour interval K indices: 32356754 (planetary), 42345653 (Boulder). At midnight there was 1 spotted region on the visible solar disk. The solar flare activity level was high. A total of 11 C, 2 M and 1 X class events was recorded during the day. Region 10808 decayed further in the trailing spot section and lost spots in the leading spot section immediately ahead of the major penumbra. The main penumbra remains very complex with the negative polarity area in the southern half continuing its westward movement. Another major proton flare is possible as long as the strong delta in the major penumbra persists. Flares: C8.5/1N long duration event peaking at 01:19, M1.3 at 02:12, C2.6 at 05:00, C1.8 at 06:53, impulsive X1.1/2N at 08:38, C1.0 at 10:42, C1.0 at 14:37, C7.1 at 15:17, C5.2 at 15:35, C1.1 at 16:20, C4.8 at 16:51, C2.3 at 18:30, M1.0 at 19:10 and C1.5 at 20:39 UTC. Early on September 16 an M4.4 flare was recorded at 01:49 and an M2.1 event at 02:14 UTC. September 15: There may have one or two smaller Earth directed CMEs associated with M and X class flares. LASCO data for the day is incomplete. Coronal holes cannot currently be reliably observed as the relevant GOES SXI, TRACE and SOHO data are all unavailable. The geomagnetic field is expected to be unsettled to minor storm on September 16 and quiet to minor storm on September 17-18. Long distance low and medium frequency (below 2 MHz) propagation along east-west paths over high and upper middle latitudes is very poor. Propagation on long distance northeast-southwest paths is poor to very poor. Trans Atlantic propagation conditions are normally monitored every night on 1470 kHz. Dominant station tonight: Radio Cristal del Uruguay with a very poor signal.